While the backbone of our business is the manufacture of overhead bridge crane systems, sometimes other crane types are appropriate to use for your operation. Our stationary I-beam jib cranes are engineered for the transport of materials across short distances. They can be outfitted with a hoist from a variety of manufacturers depending on your preferences and application. They are available in different configurations including floor-mounted, wall-mounted, and portable options in capacities from 250 lbs. to 5 tons. Our floor-mounted jib cranes have a heavy-wall steel pipe mast and a reinforced large-diameter base plate for stability. The jib is an I-beam with a tapered flange to ensure smooth operation of trolleys. They feature up to 360-degree rotation on its axis. These cranes can be bolted into the ground or certain models require the mast to be set below grade with concrete for further strength and stability for larger capacities. 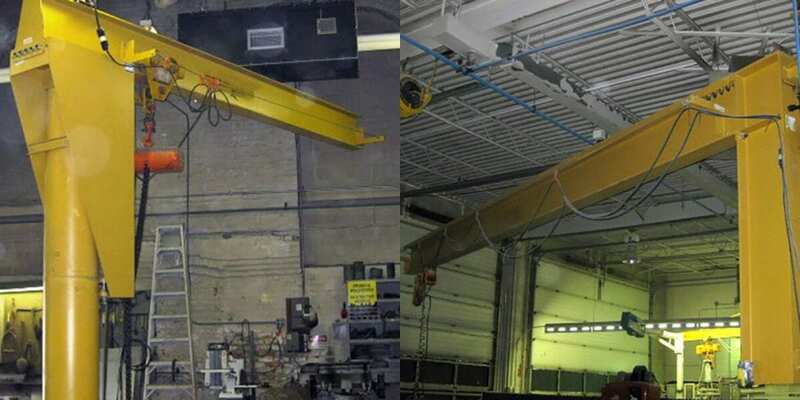 Cantilevered jib cranes – These provide up to 200 degrees of rotation and maximum headroom for the hoist. They have capacities up to 3 tons with spans up to 25 ft.
Pillar-mounted jib cranes – These sport capacities from 1/2 ton to 2 tons with spans up to 20 ft. A foundation is not required, and the vertical and horizontal beams are bolted together with 2 mounting plates and bearings.